I have been searching for the perfect (for me) maxi dress for what seems like forever. I've been wanting something with a lovely print, something cotton for summer, and something with full coverage in the front (no triangles). Welp, it's been a journey, but I've found it. This dress meets my requirements and scores big in the pretty category! Tell me, have you conquered any great clothing searches lately? It feels so good! You look beautiful in the maxi dress! :D Do you happen to be short? I'll love a dress but I'm sure it might look off with my shortness.. I'm 5'5. :) Hope that helps! This is seriously the perfect maxi!! I'm also very veryyy picky. I desperately want one of these comfy dresses but I refuse to settle for less than perfect! Never thought I could pull off a Maxi dress, thought it was relegated to tall folk only, but you're the same height as me! Hmm maybe it's time to branch out of my short dress comfort zone. For us tall folk?! I'm 6' and I can't seem to find a maxi that falls to the ground! It's always stuck at the low shin area - a really awkward length. I always thought maxis were for the relatively "normal" sized girls. The grass is always greener, eh? I have another maxi dress that I wore when I was pregnant that drags the floor now. Maybe they've just started making them a bit shorter? I don't know, but I can't wear that one anymore because I trip over it all the time. ah that maxi dress is fabulous! it's so hard to find a pattern maxi dress. what a great score, and no triangles WITH straps. fabulous! I love the telescope necklace, Katie! <3 What a cutie! Cute! It's finally warming up and I can't wait till it's warm enough to wear sun dresses. Ah... I'm still searching for the perfect maxi dress! And when I find mine, I'll definitely wear my old denim jacket with it. I love these two pieces together! Love it love it love. I love how you just look like you're having so much fun in these pics too. Such a gorgeous dress, looks amazing on you! I love this look, unfortunately I'm in a bit of a bind with maxi dresses as I'm breastfeeding. Maybe next year! that maxi dress is FABULOUS!! Perfect! I'm headed to the thrift stores today to look for more Maxi dresses. I'm at the point in my pregnancy where nothing fits and I'm tired of looking frumpy. haha. ps- I love you twirling pictures! I love the telescope necklace, looking so cutie.. I have to say that this is one of my favorite dresses you post! That is really pretty. I love your heart shaped glasses too! Such a pretty look. The dress looks perfect with that denim jacket! Lovely! You're adoreable. So is the dress, but you more so. Loove the dress. I could live in maxi dresses! That maxi is super cute! I have a solid black one, but every time I wear it my boyfriend says I look too fancy in my long, black dress, haha. I should probably pair it with a denim jacket next time. I finally found the perfect (for me) peter pan tank. Cream with a black collar that isn't too tight around my neck and it's long enough to completely cover torso. Plus, it was only $19! Score! What a beautiful find! You are right: it is so pretty. I love a good maxi! Who doesn't love an easy breezy maxi dress. And that one is adorable. I love this dress and I've been searching for a fun patterned one too but no luck yet. I'm dying that I can't go buy one of these...maybe I'll just have to go make one! I love your maxi dress so pretty and perfect for summer. Wow I love this dress, I've always wanted to try a maxi but I'm afraid to look awkward ... ;( you really made me want more now. totally in search for something like this too! and I'm on the lookout for a blazer that fits. I'll find it eventually. LOVE your maxi dress!!! i might steal it. can i steal it? borrow it maybe? no? it's yours for keeps? shucks. but you look really pretty! and i like the "denim jacket: really old" part. 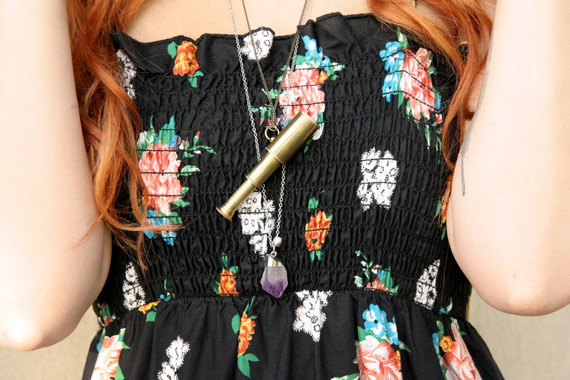 love love love the telescope necklace! and the dress is amazing too. So pretty! And I love the necklace... Super! It's perfect! I love it. Congrats on the great find. Such a pretty dress.I am giving away 50$ to ASOS and I would love for you to stop by and enter! Love your dress! <3 The prints are so cute! that dress is killer!! i have one in the women's section in my shop you may like it's not maxi but it's similar, let me know and i can discount if you wait it. it may also be too big for your skinny self! lol! I love this maxi dress! I've had to search & search to find maxis with good coverage at the top. 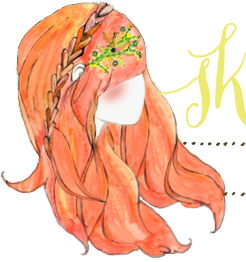 Your hair and dress are beautiful! I love that dress! Can I just say how much I admire you for being a mom with little kids and still dressing lovely? ?